This beautiful Hardanger panel is based on traditional-style Hardanger designs. Traditionally, Hardangersøm (or embroidery from Hardanger) was worked in white thread on white linen. 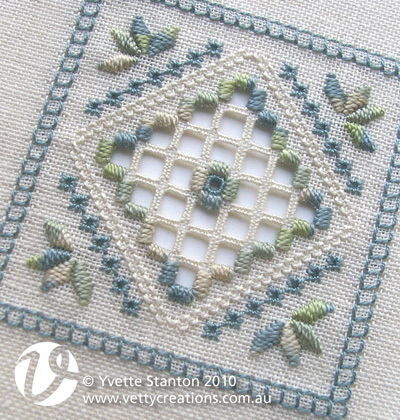 This design is worked in graceful greens and blues, and shows that traditional-style Hardanger has contemporary appeal. This pattern features detailed step-by-step instructions, with accompanying diagrams. It was designed specifically to teach Hardanger to beginners. If you've never done Hardanger before, these instructions will take you by the hand and carefully teach you how to work it. As with all my designs, if you get stuck, you can always contact me to ask questions - I don't mind at all. Of course, even if you're not a beginner, you can stitch it too! Once you've completed the embroidery, you could frame it or make it into a biscornu, pincushion, sachet, or needlebook. You could also apply it to a bag or book cover. This pattern is also available in a Raspberry colourway. Worked on 25 count linen, with DMC pearl cottons.